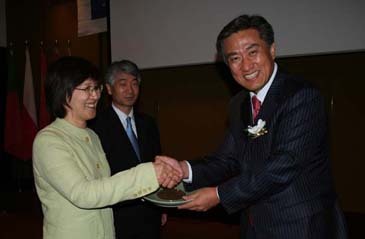 Kwon Tae Sun (left) and Han Myung Kyu (center) receive a plaque of appreciation from Seol Do Won, Samsung Tesco. Ms. Kwon Tae-Sun, lead editorial writer for Hankyoreh Newspaper, admits to "some truth to the analysis" that the "Korean press tends to be nationalist, anti-American and anti-corporate." she said at a luncheon for the European Union Chamber of Commerce Korea (EUCCK) in the Grand Hyatt Hotel on Tuesday July 11. 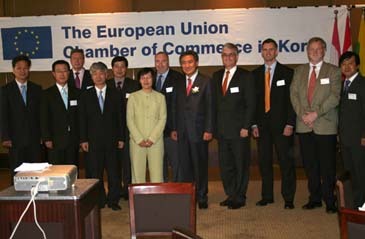 Hankyoreh wishes to convey a different image of her newspaper to top European business leaders in Seoul. Ms. Kwon Tae-Sun and Mr. Han Myung-Kyu, editor in chief of Maeil Business Newspaper, spoke at a 'PR (public relations) & Marketing Committee Luncheon Meeting' sponsored by the EUCCK. The press release called this an opportunity for "Communicating effectively with the local press-know how and experience of the chief editors of leading newspapers for CEOs, PR & Marketing Directors and Managers." Ms. Kwon pointed out some difficulties that foreign companies faced in the past with the Korean media. Korean reporters want to speak directly to CEOs' of corporations not their PR managers. A large influx of media companies has lead to conflicting stories due to inaccurate information. Ms. Kwon showed evidence to prove her newspaper isn't responsible for spreading misinformation. A poll interviewed officials of President Roh Moo-hyun's administration of South Korea. They were asked which paper they trusted most to give accurate information. Hankyoreh ranked number one. Ms. Kwon revealed, "Hankyoreh wants to write positive articles about foreign companies." She noted that they print a 'Foreign Companies Page' once a week and she's the editor. Kwon Tae Sun and Han Myung Kyu pose with EUCCK members. Mr. Han of Maeil Business Newspaper spoke of his support for Hankyoreh when he revealed that he purchased shares of the company when they started in 1988. He said his newspaper has pro-business sentiments so it would be in the best interest of European companies to communicate with them. He gave advice about how smooth relations can develop. He also mentioned that CEOs' not PR managers should conduct one-on-one interviews with their reporters. Mr. Han prefers to communicate through email with business leaders. His reporters want to write articles about companies if they have a good story-line. He suggested that CEOs should write a column to promote their corporations. Mr. Han admitted that the Korean public discriminates against foreign companies but he's trying to avoid these sentiments. Maeil Business Newspaper endorses a global outlook and wants to be recognized as a solution provider. The EUCCK should take them seriously because it's the most popular daily in Korea. After his speech, Mr. Han answered some questions from European business leaders. Most asked if his newspaper would write positive articles about their companies. He reminded the audience that he wants to be story-focused not company-focused. Both Hankyoreh expressed concerns that the foreign media portrays the Korean press as xenophobic. Hence, this luncheon gave them the opportunity to explain their side of the story. They understand that positive article about corporations will generate more advertising revenue. Ms. Kwon of Hankyoreh said her newspaper will make some efforts to portray foreign companies fairly but they won't be afraid to criticize them if they don't agree with their actions.